According to the Lexington Herald-Leader, the Catlettsburg Police Department, added the Punisher skull, complete with Blue Lives Matter slogan and flag decal, to eight of its vehicles. The city council and mayor approved the designs, which were essentially funded by local taxpayers. It’s part of a statewide effort to legally safeguard “Blue Lives Matter,” a pro-police movement, including a bill (which passed the House earlier this month) that would make attacking police officers a hate crime. Police chief Cameron Logan told io9 that they’ve since removed the car decals after receiving several phone calls admonishing the logo, as well as the inclusion of a Blue Lives Matter slogan on government property. He said he regrets using the image, calling it an oversight, and said in the future he’d do “a little more research” on the history behind some of Blue Lives Matter’s more popular icons. 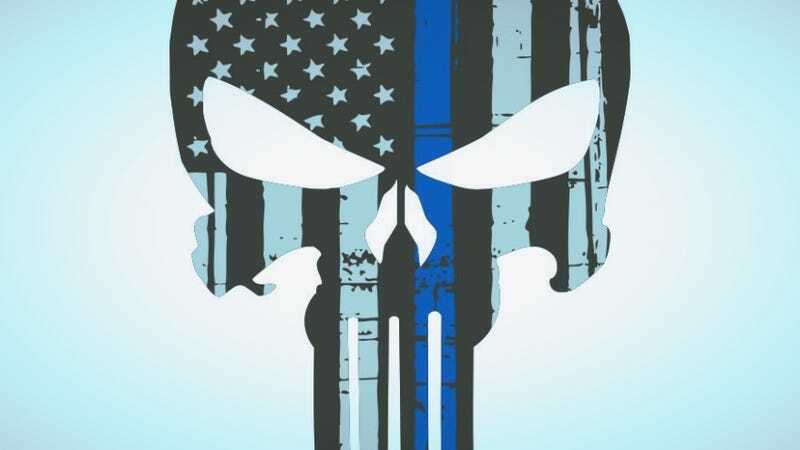 The Punisher’s logo has become a symbol of Blue Lives Matter, featured on merchandise and Facebook posts pitting officers against the proclaimed “forces of evil.” Its use partially stems from American Sniper, the popular 2015 film based on Navy SEAL veteran Chris Kyle’s life. There were plenty of homages to the Punisher in the film, including a scene where one of his fellow soldiers is reading an issue of the comic book, because Kyle loved the character. Logan himself previously told the Lexington Herald-Leader that he considered it to be a “warrior logo,” and didn’t know it was associated with the comic book The Punisher. Only here’s the thing: The Punisher is a murderer. The Punisher, who first debuted in The Amazing Spider-Man #129, represents vigilantism at its absolute worst. He considers the law to be inadequate, and thus ignores it completely. While characters like Spider-Man and Daredevil may occasionally step outside the law in pursuit of justice—usually in cases where cops are outmatched—they almost never kill in pre-meditated fashion, which is the Punisher’s modus operandi. There’s a reason he fights with other superheroes so often, it’s because of his willingness—and desire—to murder people he deems criminals. The job of a police officer is to uphold the law, to serve and protect. The Punisher kills people he feels deserve it. There’s a big, dangerous difference between these two things—and there should be.